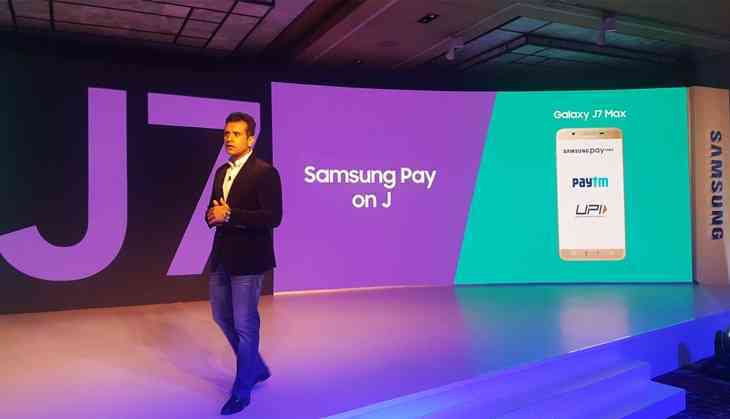 At an event in New Delhi on 14 June, Samsung launched it's J-Series smartphones -- the J7 Pro and the J7 Max, priced at Rs 20,900 and Rs 17,900 respectively. These smartphones come with all the specs you'd expect in phones costing around Rs 20k, such as 13 MP cameras, Full-HD displays, dual-SIM slots and more. Samsung also introduced some flashy features such as its new 'Social Camera'. While the J7 Pro gets Samsung Pay, something that went unnoticed is that the J7 Max will be getting Samsung Pay Mini, something that the company has quietly launched in the country today. This is different to the Samsung Pay that the company launched back in March. While Samsung Pay is seen only on high-end Samsung smartphones, Samsung Pay Mini is designed to work on those phones featuring at least an HD display and running Android 5.0 Lollipop or newer. Samsung Pay is still the company's flagship mobile payments service. Samsung Pay allows for the sale of goods and services by simply waving the customers Samsung smartphones over a point-of-sale (POS) machine. This essentially replaced the need to carry debit & credit cards. Samsung Pay works with all the swipe-based machines that support Near Field Communication (NFC) and/or Magnetic Secure Transmission (MST). Samsung Pay also comes with Paytm integration, allowing you to add money to your Paytm wallet. It also enables you to send and receive money from others without having to separately download the Paytm app. What’s more, Samsung Pay also comes with UPI integration, allowing you to make cashless payments to your family, friends and retail shops directly using the UPI mechanism which links to your bank account. The payment mode enables you to quickly transfer money using a Virtual Payment Address (VPA). Samsung Pay Mini is bringing a brand new mobile payment service to India in a bid to increase the reach of its service. This new service allows for the consumer to make online purchases with the help of a Google Play Store app. It works on all smartphones that sport at least an HD display and run Android 5.0 Lollipop or newer. This app allows access to Samsung Pay services that include membership, transportation and lifestyle. Furthermore, the company is rolling out a shopping feature that highlights online shopping malls, and there is even a rewards service where customers can accrue points based on their purchase. Samsung Pay Mini cannot be used to make offline payments at retail stores, unlike Samsung Pay. Samsung Pay Mini has UPI integrated along with Paytm. One can scan or show a barcode to send and receive payments on Paytm. Multiple UPI accounts linked to different banks can be added. What Samsung is offering with Samsung Pay Mini is a unified platform for Paytm wallet and UPI account.